If you are a fan of Asian cuisine then you are probably pretty familiar with soy sauce, the brown, salty, liquid used as a condiment or seasoning in many dishes. 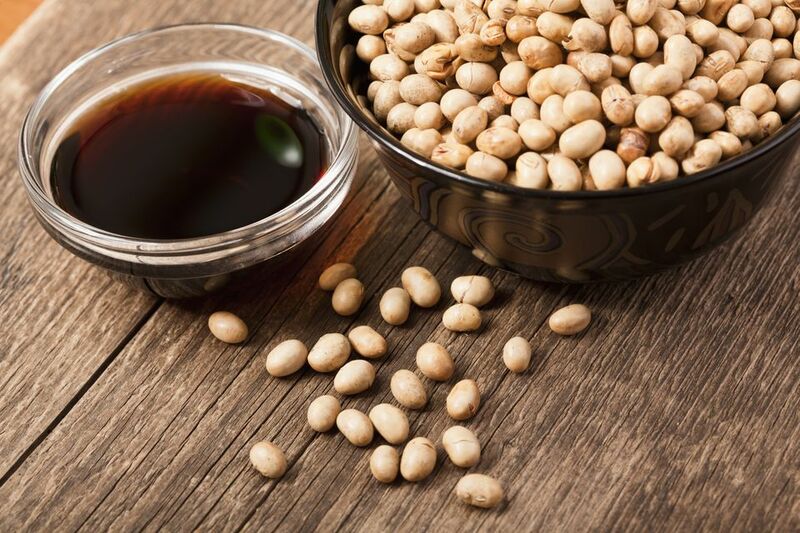 Soy sauce is made from fermented soybeans, salt, water, and sometimes roasted grains and has an earthy, umami flavor, which makes it an ideal all-purpose seasoning. The technique of making soy sauce has changed over the years, going from a process that can take months to one that produces a finished product in a matter of days. The traditional method for brewing soy sauce requires multiple steps and can take days to months to complete, depending on the recipe. Soybeans are first cooked to soften the bean, and then bacterial and fungal cultures are added to begin the fermentation process. Roasted wheat or other grains may also be included to provide a unique flavor. The soybean culture mixture is then combined with a salt brine and allowed to “brew” for a specific amount of time. During this process, the microorganisms break down proteins and sugars that are naturally found in the soybeans into numerous compounds that create the complex flavor and color of soy sauce. After the fermentation process, the mixture is pressed to extract the dark brown, flavorful liquid. (The resulting solids are often used as animal feed.) Before the extracted liquid is packaged and sold as soy sauce, it is pasteurized to eliminate any harmful microorganisms and filtered to reduce particles and other debris. Advancements in food production have led to a faster, less expensive method of producing soy sauce, which uses acid-hydrolyzed vegetable protein. This method only requires a few days and produces a more consistent product with a longer shelf life. Traditionalists reject this method, as it does not create the depth of flavor found with the traditional brewing method. There are literally hundreds of soy sauce varieties. Varieties depend on the ingredients used, the method used to create the sauce, and the region in which it is made. In the United States, there are a few main varieties that may be found in grocery stores or listed in recipes: light, dark, low sodium, and tamari. Light soy sauce is the thin, brown liquid that most Americans refer to as regular soy sauce. It is a good all-purpose seasoning and condiment. Dark soy sauce has had molasses or caramel added after the brewing process, which thickens the sauce slightly and produces a sweeter, more complex flavor. For people watching their salt intake, a low-sodium soy sauce may be the sauce of choice. Salt is an important component in the production of soy sauce because it acts as an antimicrobial agent. Most low-sodium soy sauces are made using the acid-hydrolyzed vegetable protein method, which does not utilize bacterial and fungal cultures and therefore requires less salt. Tamari is a Japanese soy sauce that is made with only soybeans and no wheat or other grains. Tamari has a very clean flavor and is favored by those who follow a wheat- or gluten-free diet. Soy sauce is notorious for containing high amounts of sodium, but it is also rich in antioxidants, isoflavones, protein, and even a small amount of fiber. One tablespoon of soy sauce contains roughly 11 calories, 2 grams of protein, 1 gram of carbohydrates, and 1006 mg of sodium. The nutritional content will vary depending on the variety of soy sauce and the ingredients used to make it. Unopened soy sauce is shelf stable and can be kept in a cool, dark place. Once opened, however, soy sauce should be kept in the refrigerator for optimum flavor. The high salt content of most soy sauces will prevent dangerous microorganisms from proliferating at room temperature, but the delicate flavor compounds produced during the fermentation process are best protected under refrigerated conditions. Low-quality soy sauces are less likely to have a noticeable degradation in flavor if stored at room temperature.